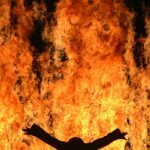 Two of the artist’s most acclaimed works, Fire Woman and Tristan’s Ascension (The Sound of a Mountain Under a Waterfall), can be enjoyed this summer on the Balearic Island. Opening to the public on June 21st the exhibition will be on view until September 30th at La Nave Salinas. 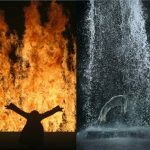 «I have always been a great admirer of Bill Viola’s work. From the first moment I entered La Nave, I have always visualized that one day his work would be projected on a large scale. This year that dream will become a reality; two of the most important works by the master Viola will be shown in Ibiza.». Fire Woman is an image seen in the mind’s eye of a dying man. The darkened silhouette of a female figure stands before a wall of flame. After several minutes, she moves forward, opens her arms, and falls into her own reflection. When the flames of passion and fever finally engulf the inner eye, and the realization that desire’s body will never again be met blinds the seer, the reflecting surface is shattered and collapses into its essential form—undulating wave patterns of pure light. Tristan’s Ascension describes the ascent of the soul in the space after death as it is awakened and drawn up in a backwards-flowing waterfall. The body of a man is seen lying on a stone slab in an empty concrete room. Small drips of water become visible as they leave the ground and fall upward into space. 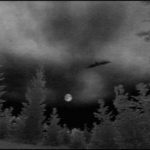 What starts as a light rain soon becomes a roaring deluge, and the cascading water jostles the man’s limp body and soon brings him to life. His arms move of their own accord and his torso arches upward amidst the churning water. Finally, his entire body rises off the slab and is drawn up with the rushing water, disappearing above. The torrent of water gradually subsides, and the drips decrease until only the empty slab remains, glistening on the wet ground. The image sequence is projected onto a tall, vertically oriented screen mounted on the wall. 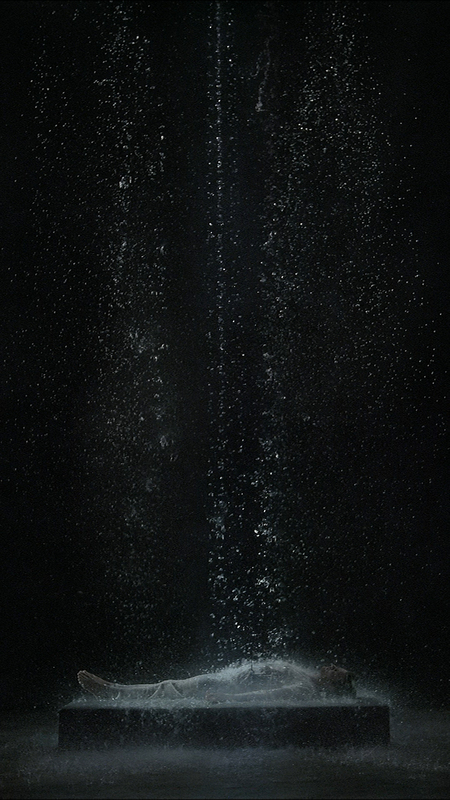 “Bill Viola in La Nave Salinas” may be visited from June 21 to September 30. Free Admission. Since he embarked in the art world in New York in the early 90s, Lio Malca has been a collector who has enjoyed showing and sharing his art with the public. Specializing in contemporary art from the mid-1960s to the present day, the collection treasures works by artists such as Brody Condon, Hung Chi Peng, Quayola, Mark Ryden, Holton Rower, Zilvinas Kempinas, Royal Art Lodge Group, Andy Warhol, KAWS, Kenny Scharf, Keith Haring and Jean-Michel Basquiat. With Haring and Basquiat, Lio Malca is considered to be internationally one of the greatest experts, collectors and lenders of his work. In addition to La Nave, Lio Malca has a gallery in Chelsea (NYC) and a hotel in Tulum (Mexico), where his pictorial and sculptural work of his collection is exhibited. In 1941, La Nave Salinas’ 7,535 square foot building was constructed as part of an employment program developed during the crisis after the Spanish Civil War as a place to store the salt harvested in the ponds of the Ses Salines Natural Park. In 2015, New York art collector Lio Malca used his understanding of art as a tool of change and social integration and turned the building into an exhibition space in permanent evolution where he shares his prestigious collection of contemporary artists from the 1960s to the present day with the public. The first project this unique space started with was the memorable exhibition by the artist KAWS. In 2016, La Nave Salinas was transformed into a theater to show two 3D audiovisual installations of the artist Marco Brambilla. In 2017, Keith Haring was the protagonist of a monumental exhibition that brought together some of his most iconic and representative pieces. 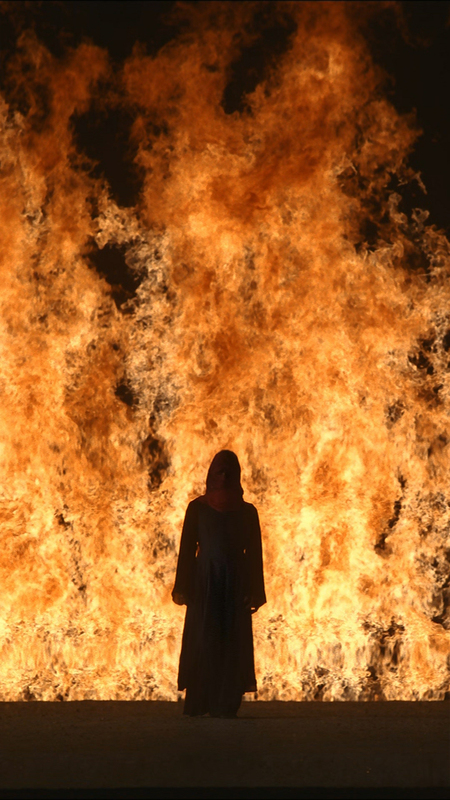 In 2018, La Nave Salinas welcomes one of the most prestigious names of video art, Bill Viola. La Nave Salinas will once again transform itself through an unexpected and surprising large-scale installation. 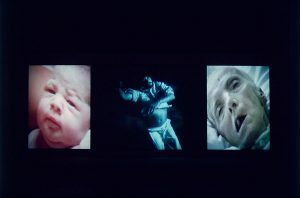 This entry was posted in EXHIBITIONS, NEWS and tagged Bill Viola, Lio Malca. Bookmark the permalink.